Emma Lokkos pushes hard, as Albany’s Emileigh Dallman is close behind. 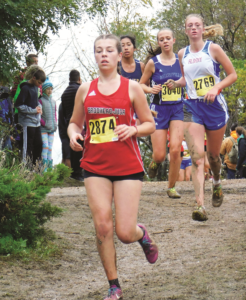 Brodhead-Juda attended the much-anticipated Baertschi Invitational in Albany this past Saturday despite weather conditions and one particularly muddy trail. Brodhead-Juda girls’ varsity team placed 6th overall in the Large School category with an average time of 24 minutes, 53.7 seconds. Boy’s varsity placed 9th overall in the Large School category with an average time of 21 minutes, 2 seconds. First place for Cardinals girls went to Madelynn McIntyre and Carter Urness for the boys.